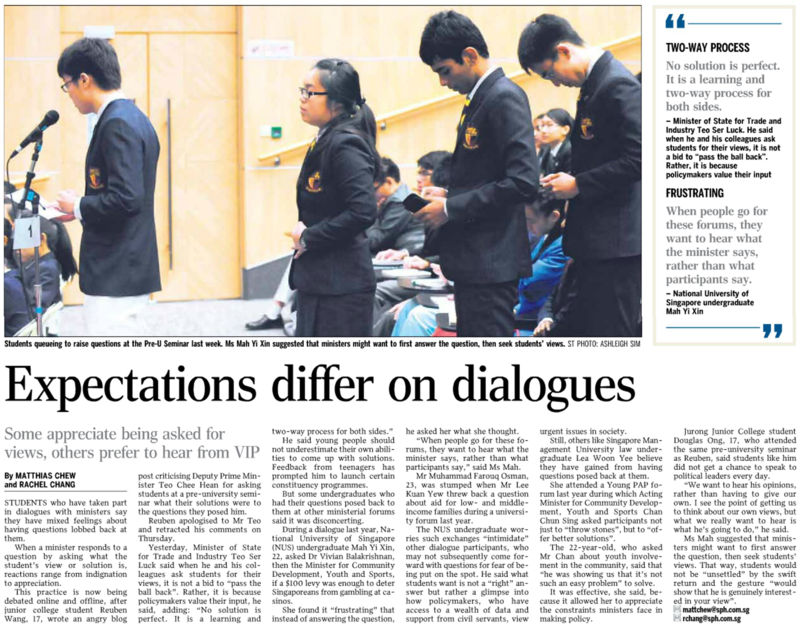 “When a minister responds to a question by asking what the student’s view or solution is, reactions range from indignation to appreciation” (Expectations Differ On Dialogues, Mr. Matthias Chew and Miss Rachel Chang). How should policy-makers – parliamentarians and ministers – respond to questions during dialogues; this was the issue that was raised by Mr. Matthias Chew and Miss Rachel Chang in the commentary “Expectations Differ On Dialogues” (June 9, 2012). Some would contend that the invited guests should be the ones answering questions and proffering solutions, others argue that participants should postulate relevant policy recommendations; however, my view is that both notions are not mutually exclusive. The best dialogue sessions are those where both parties discuss substantively along the same tangent, when suggestions are heard and debated complementarily. Expectations in the beginning might differ, but they can be tempered and managed if the organisers properly establish the rationales of and methodologies for the dialogues. Parliamentarians and ministers are graciously invited to participate in these sessions because they have the experience in the government, are cognisant of socio-economic considerations, and are in constant interactions with their constituents. In some instances, they would have to comprehend that their audience are genuinely asking questions because they do not have the answers. Participants – or individuals who pose questions or clarifications – are present because they have insights from on-the-ground experiences, and may be empowered by commentaries on the Internet. In some instances, they would have to understand that they are asked for their views because their opinions do matter. In essence, both sides must fulfil their ends of the deal. Expectations in the beginning might differ, but they can be tempered and managed if the organisers properly establish the rationales of and methodologies for the dialogues. Given the context of the Pre-University Seminar, with the presumption that the students do have a more established awareness of the concerns that plague the country, they would be in a position to follow-up criticisms with constructive alternatives. Nonetheless, this approach should not be adopted in isolation; Deputy Prime Minister (DPM) Teo Chee Hean still has the responsibility of positing policies implemented by the administration. Beyond the determination of the role of the policy-makers, the recent controversy (here and here) has also generated impetus for representatives to improve the standards of our dialogues. My personal experiences with these sessions have highlighted numerous areas for improvement: some forum participants are not adequately prepared to substantiate their perspectives effectively; particular sessions have poorly crafted themes, resulting in discussions that are too diverse and unfocused; invited guests – because of a mismatch in topics and portfolio – might not have the competence or knowledge to answer questions; policy-makers might have strategies that could prove to be counterproductive et cetera. On many occasions, organisers are too quick to brand their events as sincere engagement activities and platforms for change, but – ironically – fail to realise that poor planning and conceptualisation means that the dialogues may be exercises in futility. There should be the recognition that without tangible follow-up mechanisms in place – such as focus group discussions or the proper consolidation of feedback – dialogues per se would conveniently feature as mere communicative channels for officials to articulate their points. The status quo is not something we, as informed citizens, are contented with.